This is an activity that lets people have a chance to see art from an angle that is barrier free, whether they are another artist or handicapped. The event occurs at towns in six prefectures of the Kinki area. This festival has been held six times: 2000 at Nara, 2001 at Kyoto, 2003 at Kobe, 2004 at Wakayama, 2005 at Shiga, and 2006 at Osaka. Every time it was held it had a unique plan that was supported by volunteers with the cooperation of each town. The picture above shows the 2001 event. 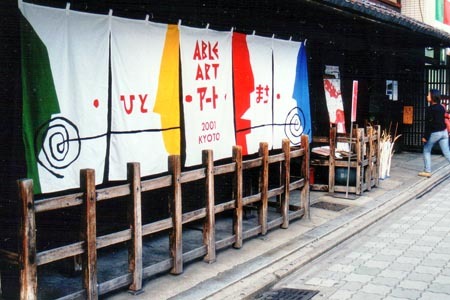 Kyoto's Machi-ya (Japanese historical tradesman's house) temporarily turned into an art gallery. We also communicated with residents or had workshops at the primary schools that were just about to close down.